If it's such a common "resting pose", where are the males doing the same thing? Hips shifted to one side, hand placed onto the top of the barrel of the firearm, offhand resting upon their hip or doing something goofy like fingerguns. Only 2 pages in too! Now, back to Infinity News and Rumors - thanks! This article from a week and a half ago. 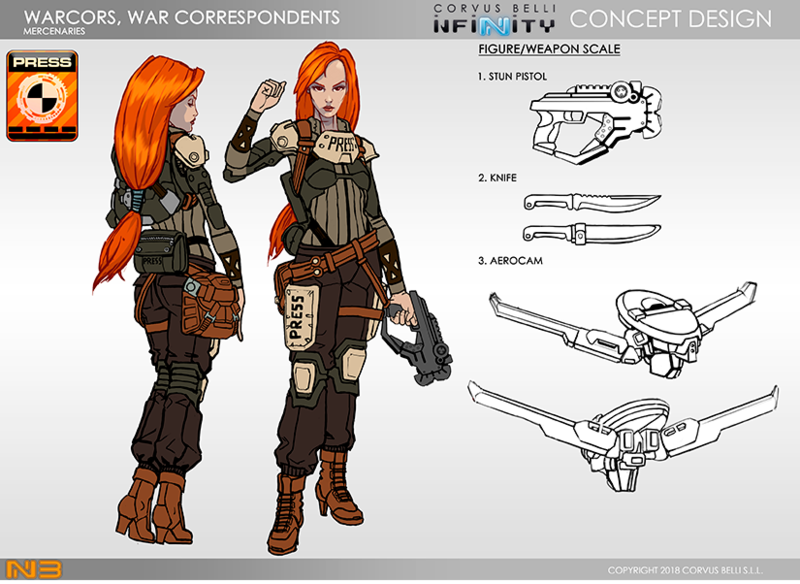 https://www.infinitythegame.com/blog/articles/item/448-2018-a-year-of-challenges Some "big news" on Beasts of War in early March. Sounds like a Paradiso N3 announcement then, or later at GenCon/for GenCon. If it's not news of some sort of the next book I'll be incredibly disappointed. Carlos said during Aresteia week that the march announcement would be huge and shake things up setting wise. They're getting rid of Tohaa. They are bringing back the Exrah. As a Merc sectorial. Actually, reading the rest of the article, they will release the Dire Foes 7: Hillbillies versus Bugs box (really called "Dire Foes Mission Pack 7: Candy Cloud") It appears to be a lead up to the next on-line campaign. The CA and USAriadna seem an odd dire foe set. This may be a clue about the setting shake-up. Yes. thats actually how humans stand. I stand like that every day. Standing next to a vertical object with one hand on her hip does not make a woman a pole dancer. Yes, you can find that pose being used several times in the Infinity line. Its actually an extremely naturalist pose, so its repetition makes sense. ... lets try not to emulate the behavior of official forums? At least not in the news & rumors thread? Please? She's supposed to be some kind of "Maya Star" from what it has her labeled as, so it's probably another reporter/reality TV star like GoGo Marlene. Remember that they've been saying for awhile they wanted to do a Nexus SpecOp/Dire Foe so this is as good of a spot as any to get one. I'm kinda worried about the USARF one since we've gotten two males now for them(the Event exclusive one is male) and I have a sneaky feeling they're gonna give us something crappy because of it. Hopefully it's the Winter Soldier knock-off that a lot of us were badgering them for, so the Unknown Ranger can have a sniper sidekick. I'm not trying to get your hopes up. It would certainly fit the description, "a very important surprise that will amaze you" . The remnants of the Concordant still in the Human Sphere of space form a Mercenary force for hire. Instant "non-aligned army". CB gave us the Krakot Renegades. Alein mercs are not ouot of the question anymore. However it is probably something else. Maybe they'll announce a fantasy skirmish game? Now that would amaze me. The Dire Foes: It'll be the USAriadna version of Uxia MacNeill. or we'll get some Scarlett Johansson as black widow shout-out. More Comic book references. Ugh. 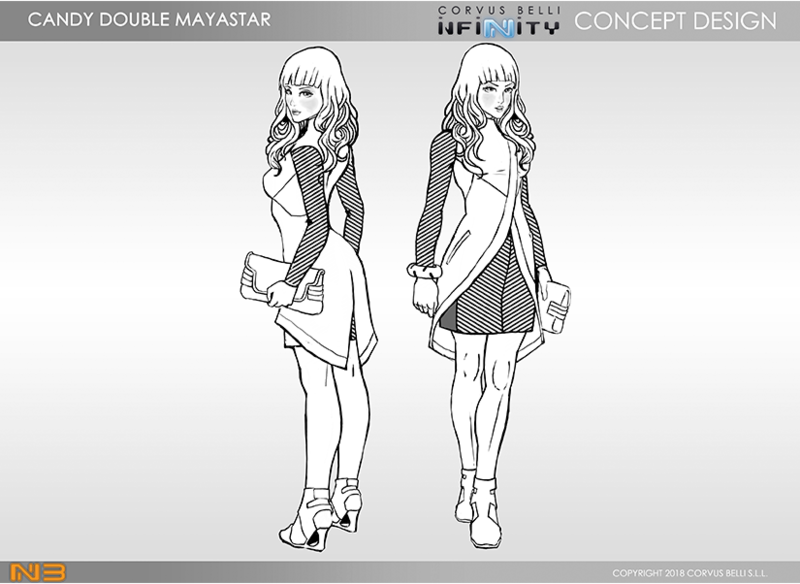 Forgot to add, "Candy Double Mayastar" CB misspelled the name. Kandi, I think would fit better. as their experience working with boardgame plastic has been positive they announce the whole line will be heading that way like guildball? Ehhh..."alien mercs" were never really out of the question. We had Le Muet before we had the Krakot. We had the fluff for the Exrah, etc. I'm going to say that it will be announcing that the Antipodes are, in fact, Tohaa creations and are joining the Tohaa. Whatever it is, it'll be tied into the BoW campaign (of course it will...) and it will probably have some silly predetermined results that make GW's worldwide campaigns look legitimate. More like it would be "scorned and angering". To understate the reaction. yes. I would say antipodes were a race that the Tohaa were 'exalting' before humans arrived and interrupted. But I don't find that surprising or amazing. Too many hints about it in the books already. Miniature poses is a topic that is important for various reasons even if I agree or disagree with opinions on them. It is always good to get perspectives and hear about bad and good ones... so I created a topic for discussion in another thread to separate it from here. Wasn't the March announcement supposedly something "more controversial than Ko Dali" or something like that? Bostria was claiming that it would be something as divisive/trolly as Ko Dali being moved over to the Combined Army. But given that it's Bostria claiming it, it's best taken with a pinch of salt since his trolling is well-known. The WarCor looks a lot like GiJoe's Scarlett. Hard to tell for sure, though considering the design overall is a bit generic. It was just a rubbis attempt at a joke because of how many characters they have. From the sounds of it it was teased as an "in universe / lore" shakeup or event, so everyone suddenly turning into plastic seems a remote possibility. New factions / faction changes, or a new campaign, or something like that seems more likely. Angel will be happy if that's the case. He hates painting them as they're just too ugly. Jeez, I'd forgotten how much tactical junk they were on. Will do a fair bit of sawing on those under-feet. Oh my, these are jaw dropping! Certainly good candidates for multi-level resin bases - like streets with kerbs, or steps.